At James Spring & Wire Company, we have helped design and manufacture wire forms for a wide range of industries from automotive to railway. Since we’ve been designing and manufacturing springs since the 1960’s, we have made it our mission to provide our valued customers not only with high-quality parts, but with valuable information and helpful facts about the springs they use most. Today we’re excited to discuss one of our most popular products, wire forms! Wire forms are one of the most versatile parts and can be manufactured in an array of materials depending on the specification. Below are the five most popular wire form applications we see, from complex industry related uses to common household items. Wire forms can be seen in a variety of electrical applications. Typically in these applications the wire form will be bent into clips that are used to hold electrical wires in place and the coating material will be tin plated copper. This basic design can also be manufactured as an antenna that clips directly onto a chip board. 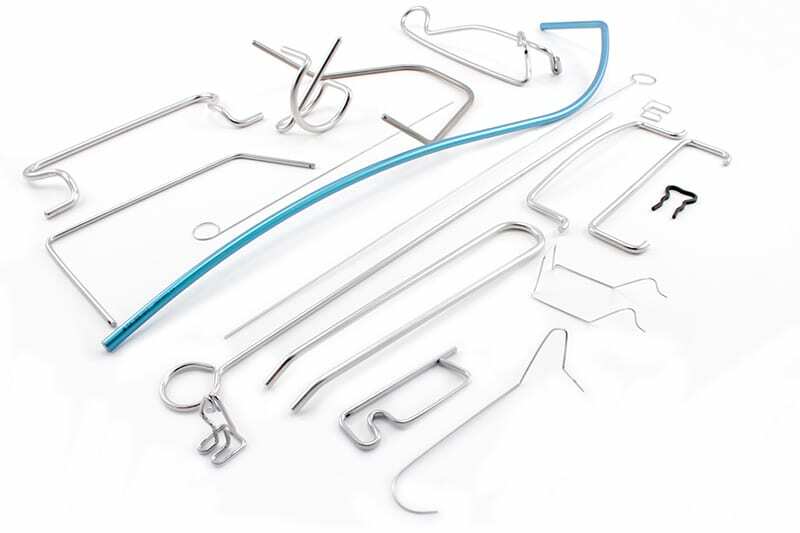 One of the most common larger wire applications is wire handles. Handles can be manufactured with wire sizes upwards of 200,000s and are designed to slip into a hole at either end with a shaped handle above for carrying. One of the most common applications for wire forms is battery contacts because they are a quick, inexpensive part to run. Battery contacts are designed to have a spiral spring with a leg that can later be welding onto a base. Some battery contacts are designed as wire form springs, although some are designed as stampings made from sheet or strip materials. Typically, this type of application requires a nickel material either as plating or as a base material. The lighting industry is one of the common industries that uses CNC wire forming because it is durable and can meet tight tolerances. Light fixture wires are common, simple wire forms that are designed to safely hold a lighting fixture in a ceiling. You may not have known, but wire forms can be found in some of the most common household items like mouse traps. This simple front portion of a mouse trap is a great example of a common wire form design. 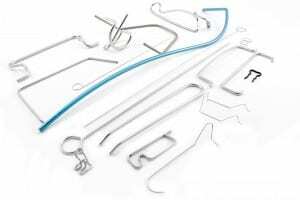 A similar design is used for safety pins but when used on a larger scale the basic shape is transformed into a large industrial or agricultural machining. Oftentimes, the larger wire forms are used to connect or link things like tractors to another piece of equipment. No matter what industry you are in or the specifications of your application, a custom wire spring can be manufactured to suit your needs. Contact James Spring & Wire Company today to get started!